Definition at line 47 of file llmediaengine.h. Definition at line 66 of file llmediaengine.cpp. Definition at line 84 of file llmediaengine.cpp. Definition at line 58 of file llmediaengine.cpp. Definition at line 437 of file llmediaengine.cpp. References createImageRaw(), getImageRaw(), getInstance(), getMediaRenderer(), getUrl(), llendl, llinfos, load(), loop(), mImageRaw, play(), S32, LLMediaBase::setBuffer(), and LLMediaBase::setBufferSize(). Referenced by LLOverlayBar::mediaPlay(), LLPanelLandMedia::onClickStartMedia(), process_parcel_media(), and start_video(). Definition at line 92 of file llmediaengine.cpp. References depth, destroyImageRaw(), LLMediaBase::getMediaDepthBytes(), LLMediaBase::getMediaHeight(), getMediaRenderer(), LLMediaBase::getMediaWidth(), height, LLPointer< Type >::isNull(), mImageRaw, S32, and width. Referenced by convertImageAndLoadUrl(), and handleSizeChangedRequest(). Definition at line 112 of file llmediaengine.cpp. Referenced by createImageRaw(), process_parcel_media(), process_parcel_media_update(), and ~LLMediaEngine(). Definition at line 95 of file llmediaengine.h. Referenced by convertImageAndLoadUrl(), and LLViewerImageList::updateImagesMediaStreams(). Definition at line 412 of file llmediaengine.cpp. Referenced by LLPanelFaceSetMediaFunctor::apply(), process_parcel_media_update(), LLViewerParcelMgr::processParcelProperties(), and LLViewerImageList::updateImagesMediaStreams(). Definition at line 119 of file llmediaengine.cpp. Referenced by LLPanelFaceSetMediaFunctor::apply(), audio_update_volume(), convertImageAndLoadUrl(), LLOverlayBar::enableMediaButtons(), LLPanelFace::getState(), LLAudioStreamMediaListener::handleEvent(), handleSizeChangedRequest(), idle_startup(), LLOverlayBar::mediaPause(), LLOverlayBar::mediaPlay(), LLOverlayBar::mediaStop(), LLPanelLandMedia::onClickStartMedia(), LLPanelLandMedia::onClickStopMedia(), prepare_video(), process_parcel_media(), process_parcel_media_update(), LLViewerParcelMgr::processParcelProperties(), LLOverlayBar::refresh(), start_video(), stop_video(), and LLViewerImageList::updateImagesMediaStreams(). Definition at line 126 of file llmediaengine.cpp. Referenced by convertImageAndLoadUrl(), createImageRaw(), handleSizeChangedRequest(), LLViewerParcelMgr::processParcelProperties(), and LLViewerImageList::updateImagesMediaStreams(). Definition at line 614 of file llmediaengine.cpp. References mProxyAddress, mProxyEnabled, mProxyExlude, mProxyPort, and mProxySocks. Definition at line 398 of file llmediaengine.cpp. 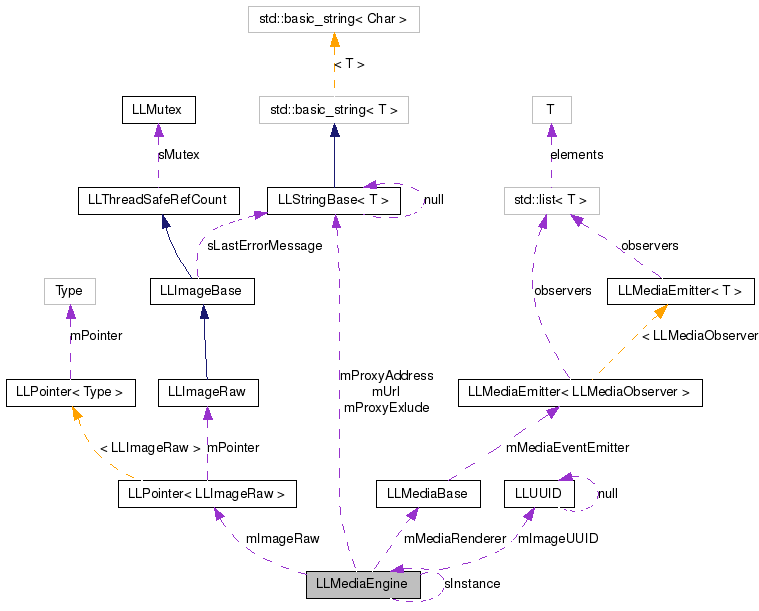 Referenced by convertImageAndLoadUrl(), process_parcel_media_update(), and LLViewerParcelMgr::processParcelProperties(). Definition at line 419 of file llmediaengine.cpp. References createImageRaw(), getInstance(), getMediaRenderer(), isAvailable(), mImageRaw, LLPointer< Type >::notNull(), and LLMediaBase::setBuffer(). Definition at line 134 of file llmediaengine.cpp. References FALSE, isAvailable(), and TRUE. Definition at line 44 of file llmediaengine.cpp. References llassert, LLMediaEngine(), and sInstance. Definition at line 384 of file llmediaengine.cpp. Referenced by process_parcel_media_update(), and LLViewerParcelMgr::processParcelProperties(). Definition at line 332 of file llmediaengine.cpp. Referenced by handleSizeChangedRequest(), init(), isLoaded(), load(), loop(), pause(), play(), seek(), setVolume(), stop(), and unload(). Definition at line 367 of file llmediaengine.cpp. References FALSE, mAvailable, and mEnabled. Definition at line 212 of file llmediaengine.cpp. References FALSE, isAvailable(), LLMediaBase::isLoaded(), and mMediaRenderer. Referenced by load(), process_parcel_media(), and process_parcel_media_update(). Definition at line 174 of file llmediaengine.cpp. References FALSE, LLMediaBase::init(), isAvailable(), isLoaded(), LLMediaBase::load(), LLMediaBase::make(), mAutoScaled, mMediaRenderer, LLMediaBase::QuickTime, LLMediaBase::setAutoScaled(), TRUE, and unload(). Definition at line 265 of file llmediaengine.cpp. References FALSE, isAvailable(), LLMediaBase::loop(), mMediaRenderer, mVolume, setVolume(), and TRUE. Definition at line 283 of file llmediaengine.cpp. References FALSE, isAvailable(), mMediaRenderer, LLMediaBase::pause(), and TRUE. Referenced by LLOverlayBar::mediaPause(), and process_parcel_media(). Definition at line 247 of file llmediaengine.cpp. References FALSE, isAvailable(), mMediaRenderer, mVolume, LLMediaBase::play(), setVolume(), and TRUE. Definition at line 483 of file llmediaengine.cpp. References convertImageAndLoadUrl(), destroyImageRaw(), LLMessageSystem::getF32(), getInstance(), LLMessageSystem::getU32(), isLoaded(), PARCEL_MEDIA_COMMAND_LOOP, PARCEL_MEDIA_COMMAND_PAUSE, PARCEL_MEDIA_COMMAND_PLAY, PARCEL_MEDIA_COMMAND_STOP, PARCEL_MEDIA_COMMAND_TIME, PARCEL_MEDIA_COMMAND_UNLOAD, pause(), seek(), stop(), and unload(). Referenced by callback_prepare_video(), LLAudioStreamMediaListener::handleEvent(), and register_viewer_callbacks(). Definition at line 572 of file llmediaengine.cpp. References destroyImageRaw(), FALSE, getImageUUID(), getInstance(), LLMessageSystem::getString(), LLMessageSystem::getU8(), getUrl(), LLMessageSystem::getUUID(), isAutoScaled(), isLoaded(), setAutoScaled(), setImageUUID(), setUrl(), TRUE, and unload(). Definition at line 311 of file llmediaengine.cpp. References FALSE, isAvailable(), mMediaRenderer, LLMediaBase::seek(), and TRUE. Definition at line 377 of file llmediaengine.cpp. Referenced by prepare_video(), and process_parcel_media_update(). Definition at line 325 of file llmediaengine.cpp. Definition at line 359 of file llmediaengine.cpp. Definition at line 405 of file llmediaengine.cpp. Referenced by prepare_video(), process_parcel_media_update(), and stop_video(). Definition at line 603 of file llmediaengine.cpp. Definition at line 391 of file llmediaengine.cpp. Definition at line 339 of file llmediaengine.cpp. References FALSE, isAvailable(), mMediaRenderer, mVolume, LLMediaBase::setVolume(), and TRUE. Referenced by audio_update_volume(), loop(), play(), and updateClass(). Definition at line 297 of file llmediaengine.cpp. References FALSE, isAvailable(), mMediaRenderer, LLMediaBase::stop(), and TRUE. Referenced by LLOverlayBar::mediaStop(), LLPanelLandMedia::onClickStopMedia(), process_parcel_media(), and stop_video(). Definition at line 225 of file llmediaengine.cpp. References FALSE, isAvailable(), mMediaRenderer, LLMediaBase::stop(), TRUE, and LLMediaBase::unload(). Referenced by load(), process_parcel_media(), process_parcel_media_update(), stop_video(), and ~LLMediaEngine(). Definition at line 144 of file llmediaengine.cpp. References FALSE, handleSizeChangedRequest(), mMediaRenderer, S32, TRUE, LLMediaBase::updateMedia(), LLMediaBase::updateMediaNeedsSizeChange, LLMediaBase::updateMediaNeedsUpdate, and LLMediaBase::updateMediaNoChanges. Definition at line 51 of file llmediaengine.cpp. References llassert, setVolume(), and sInstance. Definition at line 121 of file llmediaengine.h. Referenced by isAutoScaled(), load(), and setAutoScaled(). Definition at line 119 of file llmediaengine.h. Referenced by isAvailable(), isEnabled(), setAvailable(), and setEnabled(). Definition at line 120 of file llmediaengine.h. Referenced by isEnabled(), and setEnabled(). Definition at line 126 of file llmediaengine.h. Referenced by convertImageAndLoadUrl(), createImageRaw(), destroyImageRaw(), getImageRaw(), and handleSizeChangedRequest(). Definition at line 128 of file llmediaengine.h. Referenced by getImageUUID(), and setImageUUID(). Definition at line 125 of file llmediaengine.h. Referenced by getMediaRenderer(), isLoaded(), load(), loop(), pause(), play(), seek(), setVolume(), stop(), unload(), and update(). Definition at line 133 of file llmediaengine.h. Referenced by getNetworkProxy(), and setNetworkProxy(). Definition at line 132 of file llmediaengine.h. Definition at line 136 of file llmediaengine.h. Definition at line 134 of file llmediaengine.h. Definition at line 135 of file llmediaengine.h. Definition at line 122 of file llmediaengine.h. Definition at line 129 of file llmediaengine.h. Referenced by loop(), play(), and setVolume(). Definition at line 139 of file llmediaengine.h. Referenced by cleanupClass(), getInstance(), initClass(), and updateClass().